Chillingo, an European iPhone app publisher, has joined forces the Dutch based iPhone development studio Rough Cookie to deliver Dougie Moo’s Aqua Antics, a made-for-accelerometer title targeting casual gamers. "We are extremely excited about Dougie Moo - it has been designed with the iPhone in mind - making full use of the touchscreen and motion-sensitivty of the device, providing a very unique gaming experience for the iPhone user. And yes, it works for the iPod Touch too." said Chillingo Director, Chris Byatte. Dougie Moo's Aqua Antics features 30 unique levels of addictive puzzle action. 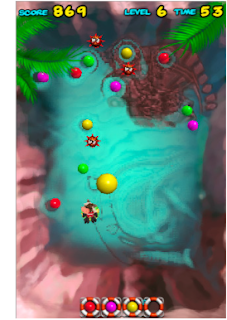 Using the device's accelerometer, players can control Dougie Moo to combine sets of coloured balls that float on a body of water. Spread over 5 worlds, Dougie needs to navigate through all sorts of hazards, like sharks, bombs and even homing blowfish! Featuring full use of the iPhone and iPod Touch's tilt and touchscreen functions, a high score save system and full screen water simulation, Dougie Moo's Aqua Antics is a thrilling water adventure sure to make a splash! Dougie Moo's Aqua Antics is priced at EUR2.99 and is available now through Apple's App store.